Pheidole megacephala is a species of ant in the family Formicidae. It is commonly known as the bigheaded ant in the USA and the coastal brown ant in Australia. It is a very successful invasive species and is considered a danger to native ants in Australia and other places. It has been nominated as one of the hundred “World’s Worst” invaders. There are two types of worker ant, the major or soldier ant and the minor worker. The common name of bigheaded ant derives from the soldier’s disproportionately large head. This has large mandibles which may be used to crush seeds. The soldiers are about four millimetres in length, twice as long as the minor workers. The colour of both types varies from yellowish-brown or reddish-brown to nearly black. The rear half of the head is smooth and glossy and the front half sculptured. The twelve-segmented antennae are curved and have club-like tips. The waist or petiole is two-segmented with the node immediately behind conspicuously swollen. There are a pair of short, upward-facing spines on the waist. The body has sparse, long hairs. Bigheaded ants nest in colonies underground. Colonies can have several queens and super-colonies can be formed by budding, when a queen and workers leave the original nest and set up a new colony nearby without swarming. 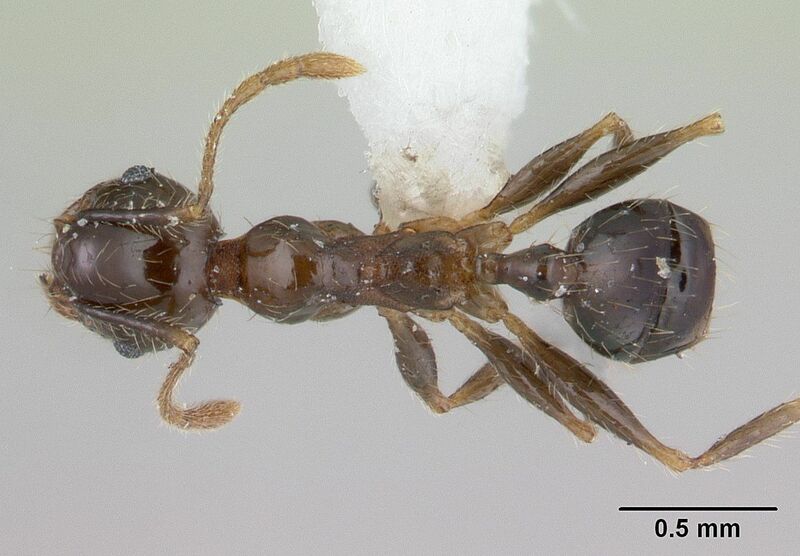 In Florida, nuptial flights of winged ants take place during the winter and spring and afterwards, fertilized queens shed their wings and find a suitable site to found a new colony where they start laying eggs. Each queen lays up to 290 eggs per month. The eggs hatch after two to four weeks and the legless white larvae, which are fed by the workers, pupate about a month later. The adult workers emerge ten to twenty days after that.